Kids are small but sometimes you find big dreams in their small eyes. These big dreams give a huge success to that kid as well as proud to his/her parents and country. Here I have one question from you all, Do you think healthy eating plays an important role in this success? If you ask me then I would say YES, maybe will power may not affect his enthusiasm but low health will definitely affect his body and resist him in achieving his goals. Let's discuss the current criteria about the children's health. In this century, children are more attracted towards technology and junk food. Instead of playing outside they prefer to play on computer or with video games. These games are like addiction in children, it affect the child mentally and physically. Whereas junk food is the way to increase the level of deficiencies and problems. Junk food increases the constipation, obesity, depression, lethargic, high fat etc. Junk food never make an active mind and body. This is the current situation of the current generation, may be their minds are sharp but their body is dull. Now on other side, talk about the parents of these kids: No doubt in it, the current economy demands both parents working and due to that child suffers. Their life is like machine which keeps on working and always find the easiest way to compensate the daily needs. When they don't have time for their kids they ask them to play with computer or video games. When they don't have time to cook they prefer outside food or most of the time junk food. Due to this rush, parents are also making their life hell, full of tension, no peace, no mental satisfaction, no physical activities nothing such activities which give relief to them. When there is a problem solution is always there. And the solution is " Horlicks Growth Plus". Two cups of Horlicks cover these foods. Horlicks Growth Plus is the solution which catchup the health of your child plus improve the child's growth incredibly. 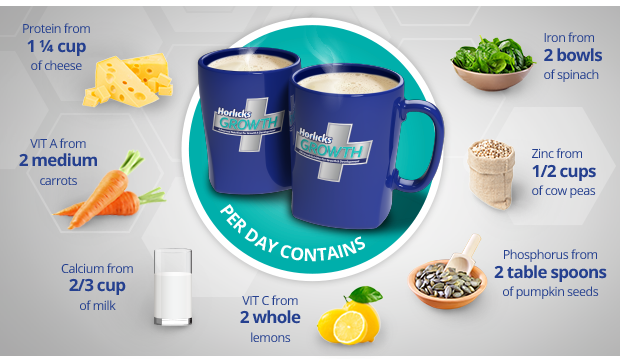 As Horlicks Growth Plus is not just a flavored powder, it contains balanced nutrients, vitamins, minerals and proteins. Through this the child will get all nutrition which his body need to grow fantastically. Undoubtedly, it will help your child #CatchUpOnGrowth. 1: Its is clinically proven that it enhance the child's growth naturally. 2: It contains the vitamins, minerals, proteins etc which helps in significant growth of a child. 3: It is specially designed to overcome from the fallen growth of a child. 4: It has essential amino acid. 5: Fallen growth will improve with regular intake of Horlicks Growth plus and bring back the health on the track in a natural way. 7: Clinically proven for getting good results in just 6 months. Important Conclusion: Being a parent, I always wish nourish my child with healthy food and drink. There is no doubt if I calculate my child's health, it will definitely shows a " RED MARK". And this is a point where I need to pay attention and give him such supplement which fulfill his deficiencies and improve his height and weight. I never wish to see my child look weak and dull among other children after all its a matter of his life. When lots researchers and doctors have proven " HORLICKS GROWTH PLUS" is clinically tested and gives positive result in just 6 month with its regular use. Then we all should trust them and give your child a healthy life.